Saag paneer is a traditional Punjabi recipe for a mixture of mustard greens and spinach, cooked together with spices in a creamy sauce that is dotted with cubes of fried paneer. It is by turns, tingly, velvety, and tender-chewy, with a lovely flavor from the combination of spicy mustard greens and smooth, mild spinach. Truly, saag paneer is one of my favorite northern Indian specialties; I like it even better than rogan gosht or mattar paneer. This is probably because I have such a passion for greens–spinach was a favorite food when I was a small child and I adored both mustard greens and kale. Collards and turnip greens were also eaten often in the winter months during my childhood, and I loved them all, which is a great thing, because all dark green leafies have a hefty dose of vitamins, minerals, antioxidants and phytochemicals. When I make saag paneer, I do not feel constrained by the rule that it should contain only mustard greens and spinach; I like all of the greens so much that I cannot restrain myself from adding them into the mixture. Besides, most restaurants make “saag paneer” using only spinach–which really should be called “palak paneer.” “Palak” is the word for spinach–and saag paneer made this way is too mild for my taste. Nothing wrong with it, really, its just not as robust and satisfying as proper saag paneer. Also, most restaurants puree the spinach in saag paneer, until they have essentially made a very smooth, thick sauce for the fried paneer cubes. 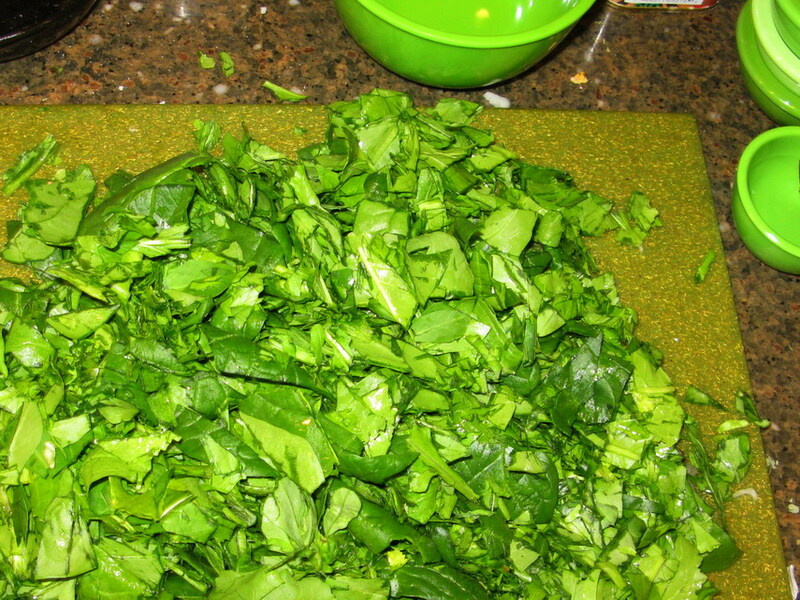 That is fine, but I like my greens to have more texture, so I roughly chop mine, and let the cooking wilt them to a soft silky texture that still has a toothsome quality. This particular batch of saag paneer included fresh local spinach, local turnip greens standing in for mustard greens, (they are in the same family, after all) local arugula, fresh methi greens and collards. 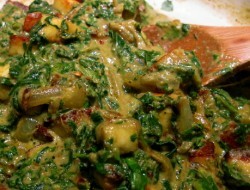 To boost the fragrance of the methi, I added soaked dried methi greens to the masala paste before grinding it. In order to make great saag paneer, the greens re important, but so is the cheese. Make your own, or get the best quality store bought paneer you can–fresh, not frozen. Frozen paneer can get mealy in texture and is not good. 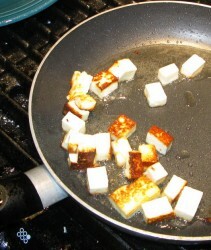 To pan fry paneer for curries, I cut it into 1/2 inch cubes. I start by slicing 1/2 inch thick pieces across the length of the block of cheese. Then, stacking three of these slices together, I cut them in half longitudinally, then cut those pieces into three cubes–you got it, approximately 1/2 inches each. Lots of recipes call for 1 inch cubes of cheese, but I like the smaller cubes better. More crispy crust to chewy cheese ratio, and I think they look prettier in the dish that way. 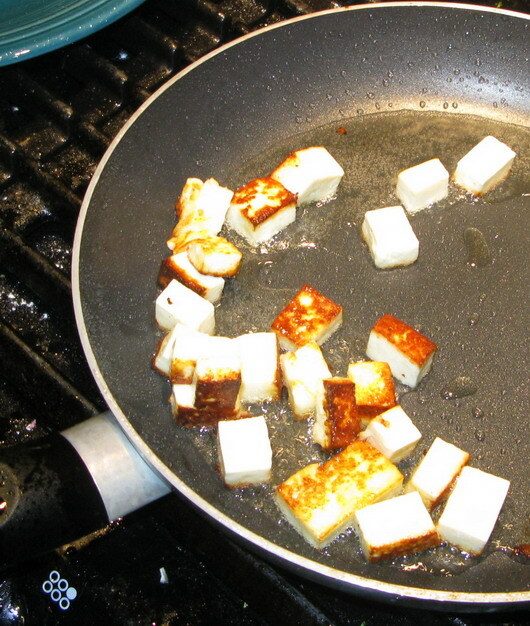 Pan-frying paneer is simple, and is one of the few times I still use a nonstick skillet. I pour a couple of tablespoons of canola or peanut oil into the nonstick skillet and heat it until it shimmers over medium high heat. Then, I scatter a handful of paneer cubes over the bottom of the pan, and let them brown on the bottom. Then, using a spatula, I turn the cubes and let them brown on all sides. Be careful not to overcrowd the pan–it makes it easier to turn the cheese cubes if the pan isn’t crowded, and of course, it keeps the oil from cooling too much. Cooled oil will seep into the cheese and make it heavy and greasy. Once the cheese is brown on all sides, remove it from the pan to drain on a pile of paper towels. If you want, sprinkle some with salt and have a great snack while its still hot! One thing I have to warn you about–frying paneer can be a messy business, as the cheese sputters and pops, sending oil droplets spattering over the stovetop, the countertop and your arms. Wear long sleeves and an apron to protect yourself from the shower of hot oil, and keep your face well away, especially when you turn the cubes with the spatula. Taking a hit in the face with hot oil, which I have had happen more than once, is not fun. Once the cubes are all fried, you can let them cool down and store them in the fridge for later use or just set them aside until you have the rest of the curry ready. The cheese hardens up as it cools, but have no fear–once you put it into the curry, it will soften right up and as it warms, it will become like little sponges, soaking up the sauce and flavors, taking on a chewy texture that is a delightful contrast to the soft greens. Heat the oil or ghee in a heavy bottomed, deep skillet or pot over medium high heat and add onions when the oil shimmers. Sprinlkle with salt and cook, stirring as needed, until the onions are a nice medium golden brown. Add the mustard and cumin seeds. Grind together the next few ingredients, from the dried methi leaves to the Aleppo pepper flakes, into a yellowish green paste, using some of the soaking liquid from the methi as needed to make a smooth paste. When the mustard seeds sputter and pop, add the spice paste, and cook, stirring, until everything is fragrant and the onions are a reddish brown. Add the greens all at once, and stir in the water, starting with the smaller amount. Cook, stirring until the greens deepen in color and wilt. Once the greens are wilted, stir in the yogurt and cream. Bring to a simmer, and add the paneer, and cook, stirring, until the cheese is heated through and spongy–about five to ten minutes. Add salt to taste and serve with naan or roti or steamed basmati rice. gosh i’d love some sag paneer now! i tried making it, using sailu’s recipe, and it was delish. as indeed all her recipes are! Hi Barbara, I happened upon your blog while in search of information on Buwei Yang Chao’s How to Cook and Eat in Chinese for a future post. GREAT info, I’ll be linking for sure when I do post it. Anyway, I just had to tell you how much I enjoyed my visit. I have bookmarked it and after the holidays will return. In the mean time, I am adding your blog to my Hospitality Search Engine. You offer a wealth of information and tantalizing recipes (I too would love a nibble of your Saag Paneer about now) Thanks for sharing & Happy Holidays!!! Awwww, poor meatses. It’s okay, they still love you. I don’t usually have milk or paneer around, but I make saag a lot, and it is indeed comfort food. I make mine with 2/3 mustard greens and 1/3 spinach, or sometimes 1/2 and 1/2. I never add methi, but that sounds good & I will try it next time for sure. You always get me inspired when I read your recipes! I find leftover, cold saag is a great sandwich filling along with cheese. I’m going to try my hand first at making paneer since I cannot buy it locally. Then I’ll try to make this recipe 🙂 I think I can find most, if not all, the herbs at the health food store. Looking for ways to use some of the swiss chard in our garden. Think I’ll throw in some chickory for the fun of it too. Barbara THANK YOU for posting this recipe!!! I LOVE saag paneer, and as a matter of fact, it is the only way my husband will eat spinach. I cannot wait to try it! 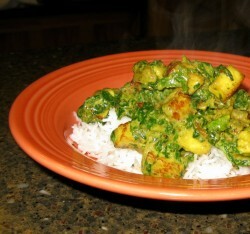 Hi Barbara… The Saag Paneer is truly an awesome treat, especially for Paneer lovers! The addition of mustard greens sounds interesting. I also like that you have cooked the saag for a minimal period instead of overcooking it, thus retaining the nutrient value of the greens as well as making it look fresh and green! And then you have added methi too… interesting. I like the way you always write in such a detailed manner! Cheers. http://roostershamblin.wordpress.com/ would you please spend a few minutes checking out my chicken blog because it is very informative about all things chicken related. I have been raising more than 50 breeds of chickens 40 years. I googled saag pander recipe and it seems no one else knows the difference between palak and saag! Thank you for this recipe. Received a box from my csa yesterday with chard, spinach and kale. Love spinach paneer. Now I’m going to try saag paneer. I still havent made this, maybe I will with the long weekend here. For some reason you’ve popped up in my google reader again. Thanks for the reminder! I hope alls well, I really miss your wise words.